Draws will be held every Thursday & Friday night throughout 2019 until the date of the draw. 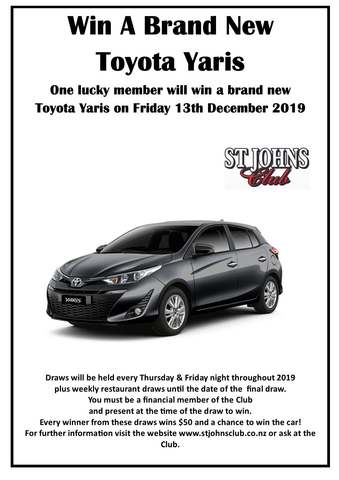 You must be a financial member of the Club and present at the time of the draw to win. Every winner from these draws wins $50 and a chance to win the car! Terms and Conditions Apply – Click here to read them. Two separate draws are drawn from the Membership Role between 6.00 – 7.00pm each Thursday and Friday.